Flying at 29,000 ft. near Zagreb, Yugoslavia, last week, Lufthansa Pilot Josef Kröse chanced to glance above him. There he saw a scene that caused him to stare in disbelief. Four thousand feet overhead, at the same altitude, two other jetliners were closing fast from opposite directions. As Kröse looked on in horror, the planes smashed head-on into each other. They immediately fell from the sky in battered pieces of wreckage that landed twelve miles apart; at least one woman, working on her farm, was killed by the debris. After reassembling corpses, which were strewn all over the broad area, as best they could and checking them against airline lists, Yugoslav authorities announced that 176 people had died in the collision. The toll was the highest in aviation history for a two-plane crash, exceeding the casualty list of 162 five years ago at Morioka, Japan, when a Japanese fighter with a student pilot at the controls plowed into an All Nippon Airways Boeing 727. "OK. We'll remain precisely at 330." The time was 10:14:38. Three seconds later the outer five meters of the DC-9's port wing sliced through the Tridents flight deck, killing Tann, Flint, and Helm instantly. 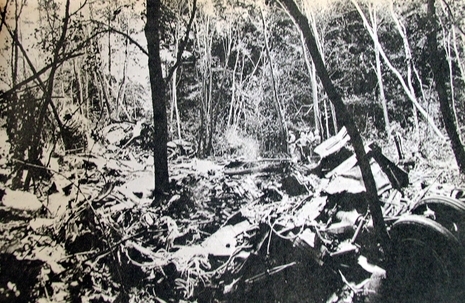 As JP550's wing tore off, the two aircraft rolled together and fell from the sky. The DC-9's CVR caught F/O Dusan Ivanus's last words, as he sat in the right hand seat behind his usless controls. "We are finished," he said, "Goodbye. Goodbye." 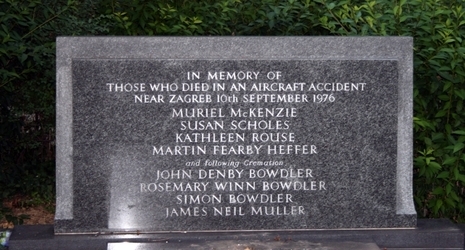 The 1976 Zagreb mid-air collision occurred on 10 September 1976 when British Airways Flight 476, a Hawker Siddeley Trident 3B en route from London Heathrow Airport to Yeşilköy International Airport, Istanbul, collided in mid-air with Inex-Adria Aviopromet Flight 550, a Douglas DC-9 en route from Split Kaštela/Resnik Airport, Yugoslavia, to Cologne Bonn Airport, West Germany, at 11:15am local time (10:15 UTC). All 176 people aboard both flights were killed making it, at the time, the world's deadliest mid-air collision; it had a death toll higher than that of All Nippon Airways Flight 58. It was, and remains, the only fatal accident to befall an aircraft operated by British Airways.